With the prevalence of UAVs within the mining industry, operations now have at their disposal unprecedented amounts of data to use. Turning this data into usable and valuable information (both quickly and efficiently) is the key to providing value. The purpose of this document is to demonstrate a rapid, repeatable method for generating stockpile data from scan files. While each scanner/Unmanned Aerial Vehicle (UAV) provider can produce a point cloud and associated image, it is reliant on the user to interpret, analyze and report metrics from the data. In this paper, a workflow has been developed to create reportable data able to integrate with other Deswik modules and allow various queries to be run within a pivot. Once the data has been created in a point cloud file (*.xyz or *.las) with the associated image file, it is up to the mine surveyor (or equivalent) to find the most efficient way to generate the End of Month (EOM) data for the operation and recipients of the reports. Most of the functions in this project rely on standardization of the layer control and layer names. If any are modified or removed then the processes will cease to operate as designed. By assigning as many commands into the process map as possible, it reduces the reliance on user input and therefore error in the data. This process serves as an introduction to processing point cloud data and generating reports. 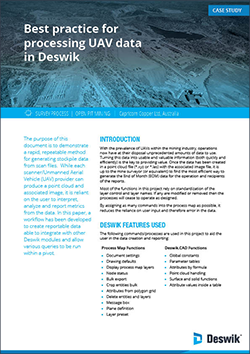 The use of attributes is one of the key fundamentals to getting the most out of Deswik software. The stockpile data could have more attributes assigned to them which would be used within other Deswik products, such as Deswik.Sched, Deswik.LHS, and Deswik.OPSTS. Each dataset took less than 10 minutes to process and gain the required data to be fed into the pivot report. As operations become more reliant on shorter term control over material handling, a simple, efficient workflow to take the raw data and generate reports is becoming necessary. These concepts can be expanded on to suit each sites requirement and the outputs tailored for the recipients.